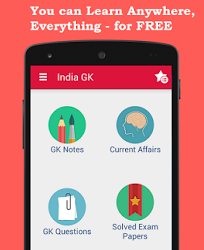 19th, 20th January 2017 Current Affairs MCQs, Quiz, Questions: Current Affairs for January 2017, Daily Multiple Choice Questions (MCQs) for India GK, World GK and current affairs with Collection of daily objective type Question by www.Indiagk.net based on General Knowledge (GK) and General Science (GS) Questions for UPSC, State PSC, SSC, Police exam, Railway exam, SBI, Bank PO, IBPC, SSC, LDC, UDC, Army, Airforce, Navy, Coast Guard, Bank Clerk, TET and all entrance examination with current affairs News, Multiple Choice Questions (MCQs) available on Website www.IndiaGK.net and Android Apps with daily updates:. Which country pips US in Google Play downloads as per recenty data? Mawlynnong, The cleanest village in Asia is located in which state? CCEA recently approve listing of 5 PSU General insurance companies in the stock market. The government will bring down its holdings from 100% to --- ? Which Indian cricketer has been inducted into Legends Club Hall of Fame? Who is Appointed as New CBI Director on 19th January?